Remove all labels and tags from the craft pumpkin. The pumpkin should be made of thin plastic or painted paper mache so the material is thin enough for the thumbtacks to pierce. Using a 4″ piece of masking tape, cut both ends at a 45 degree angle. With subsequent strips, cut some so the ends point to the left and others to the right. 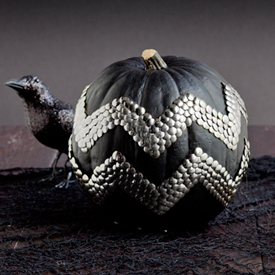 Align the cut lengths to form the individual chevrons and repeat around the pumpkin. After taping your pattern and adjusting as necessary, trace the outline of the pattern with a pencil in a contrasting color so the guide lines are visible. Remove the masking tape. Pin the tacks along the bottom of each pattern area, overlapping each tack slightly and pinning completely around the pumpkin before starting a new line. With each new line, overlap the prior tack slightly to prevent visible gaps. Continue until you reach the top guide of each area you want to fill with tacks. If necessary, tip the top row of tacks back slightly to finish off the look if the tacks aren’t flush with the surface of the pumpkin.